Scott Hutchison of Frightened Rabbit live @ The Caves, Edinburgh. Credit: Flickr/Marcus Thorsen. CC BY 2.0. 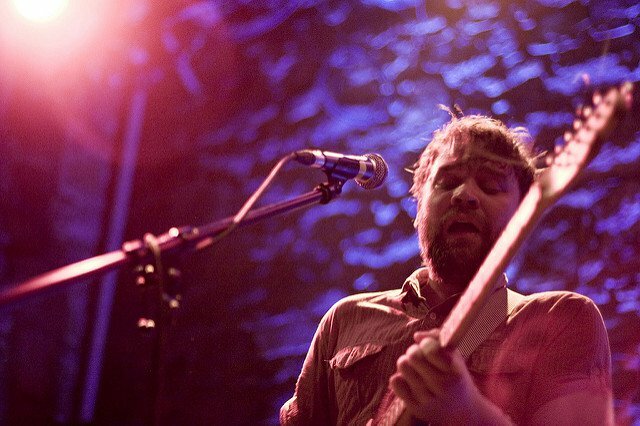 Last month, the tragic news of the death of Frightened Rabbit singer Scott Hutchison hit the music community hard. He had spoken openly about his struggles with anxiety and depression, and channelled raw emotion into his songs. He was found dead at the age of 36. Hutchison wasn’t alone in facing these problems. Around one in four people in the UK experience mental health issues each year, and this problem affects musicians disproportionately. A 2016 survey by the University of Westminster for the charity Help Musicians UK found that those working in music can be up to three times more likely to suffer from depression than the general public. Addressing this problem isn’t just crucial for musicians; it’s crucial for the whole of society and the economy, and for our collective health and wellbeing, because we all benefit when the creative arts are thriving. Mental health is complex and there are many factors that can impact our wellbeing, from our surroundings to our relationships. But the Westminster research highlighted something that many people already know only too well—that musicians face unique pressures. Low and unpredictable pay and a lack of financial stability affect musicians’ mental health, and the uncertainties around employment go hand in hand with the pressure to be ‘creative on demand.’ Many are forced to juggle several jobs and often work away from home which can be exhausting and isolating. The absence of a regular routine along with poor sleep and bad eating habits all influence wellbeing. “Being a musician has the impact of any self-employed job, you never switch off, everything is connected to your success; your relationships, your friendships and your social life,” Joe Tilson told me in a recent interview, a singer-songwriter from West Yorkshire. “At the time I never thought of music as the cause of any of my low points, I saw it as the escape and cure, that I was lucky to have it. But it’s not just the conditions that musicians face in the music industry that creates these problems—it’s also the condition of the industry itself. Over the last decade, austerity in the UK has squeezed local authority spending on arts and culture. Early in 2018, research by the Musicians’ Union found that 44 per cent of orchestral musicians in the UK say they don’t earn enough to live on because of funding cuts. Because of this increasing financial squeeze, professional musicians who have spent years honing their talents are being forced to take other jobs, and it’s not a stretch to say that someone’s self-worth may decline when they aren’t able to use their skills to make a living. Musicians in the UK aren’t alone in facing this problem. In the US, for example, President Trump has repeatedly sought to end federal funding for government arts programmes, although fortunately, he’s been unsuccessful so far. Despite the huge contribution of the music industry to the economy—with creative industries estimated to generate £85 billion net annually to Britain’s GDP according to 2016 figures—governments still fail to recognise its importance, including in education. Recent research by the BBC found that creative arts subjects are being cut back in many schools because of funding pressures and an emphasis on a narrow core curriculum. For universities meanwhile, courses in creative subjects are being undermined by a focus on graduate salaries as a measure of success, with many arts and humanities courses being labelled as a waste of time because they won’t lead to well-paid employment. Music venues, which are integral to local communities, are closing. Around a third of the UK's small gig spaces have closed in the past decade, according to Music Venue Trust. One venue in south London, The Montague Arms, shut just a few months ago only to be replaced with a music-less gastropub—of which there are plenty already. While these issues may not directly lead to mental health problems they send out the message that creativity isn’t valued, and when combined with the challenges musicians already face they have the potential to undermine their wellbeing even further. Witnessing the arts being sidelined runs the risk of depleting musicians’ self-worth and self-belief. Therefore, ensuring that everyone working in music has access to mental health support is essential, and there are a number of organisations which do offer help. Last year for example, Help Musicians UK launched Music Minds Matter, a 24/7 nationwide mental health service for anyone working in the music industry. Despite government cuts to arts funding, the charity is increasing its support for various initiatives including the Musician’s Hearing Health Scheme and the Creative Programme, which supports emerging artists. Musicians can also access free health assessments through The British Association for Performing Arts Medicine (BAPAM), while the charity Music Support offers help to anyone working in the music industry struggling with their mental health. It also provides ‘safe tents’ at music festivals for artists and those working backstage to address issues that may come up while on tour. Mind, the national mental health charity, also provides advice and support. None of this is just an issue for individual musicians; protecting them and their ability to make music is also crucial for the health and creativity of society as a whole. We often express our innermost emotions and feelings through music and communicate to others what isn’t always possible in words. Listening to music has a major, positive impact on our mental health, in part because it releases dopamine, a neurochemical that’s linked to wellbeing. Music lessons in schools also have huge benefits for children, boosting their happiness, self-esteem, concentration, numeracy and language skills. “The positive impact of art and culture on society can’t be overstated,” Ruth Kilpatrick told me, who works with the ‘PRS for Music Fund,’ a charity providing financial help and support to members of PRS, the UK’s music licensing organisation. Singer-songwriter Joe Tilson takes this argument one stage further: in an age where more work is being automated, he told me, it’s especially important to recognise the importance of creative arts and music.